I have been involved with various African and international NGOs and development organisations for the past 25 years, both professionally and through my desert running efforts, and it is therefore not too difficult to find the correlation between the challenges associated with making the world a better place, and completing a multi-stage desert foot race in some of the harshest environments on the planet. My next desert race is the six-day, 250km Fire and Ice Ultra from 27 August – 1 September 2018 in Iceland. This will be my tenth international desert race, and if successful, I will become the first African, and one of only a small group of people, to complete a multi-stage desert race on all seven continents. Beyond achieving a special running milestone, the period before and during the race is also another opportunity to do something special in support of African NGOs making a difference in society. I am dedicating my participation in the Fire and Ice Ultra to the African NGO sector in general. It is an opportunity to celebrate NGOs’ unique contributions across the continent, generate support and awareness for their work, and reflect on the state of the sector. All the profiles and articles are published on my blog – https://desert2desert4socialcauses.com – and other online platforms, and promoted via various social media channels. This six-day, 250km race starts near Europe’s largest glacier, the Vatnajokull Glacier, and then winds its way north across the remote landscape of the Icelandic Highlands. Runners are self-supported throughout the race and only provided with tents and hot water, thus adding to the physical challenge of this event. Since the race was first held in 2013, the Fire and Ice Ultra has gained a reputation as one of the toughest foot races in the world. Moroccan ultra-marathon runner, Mohamad Ahansal, described it as “tougher than the Marathon des Sables”, an annual race held in the Sahara Desert. Mohamad and his brother, Lahcen, have won the Marathon des Sables 15 times between them, and his views therefore confirm the stature and challenging nature of the Fire and Ice Ultra. Except for the 2014 Last Desert Race in Antarctica, all my previous desert races were held in very hot conditions. The Fire and Ice Ultra, however, will be another “cold race”, with many icy river crossings and temperatures dropping to minus five degrees at night. These conditions will ensure that this race will be another extreme physical challenge and an “appropriate” setting for my attempt to become the first African to complete a multi-stage desert race on all seven continents. Refer to http://www.fireandiceultra.com for more information about the race. I have already completed nine international desert races, and used each race to support one or more African NGOs and social causes. 250km Big Red Run from 24-29 June 2017 in the Simpson Desert in Australia in support of Youthzones and a community in Hammanskraal to acquire Hippo Rollers, a unique South African invention which makes it extremely easy for people in remote rural areas to collect and store water. 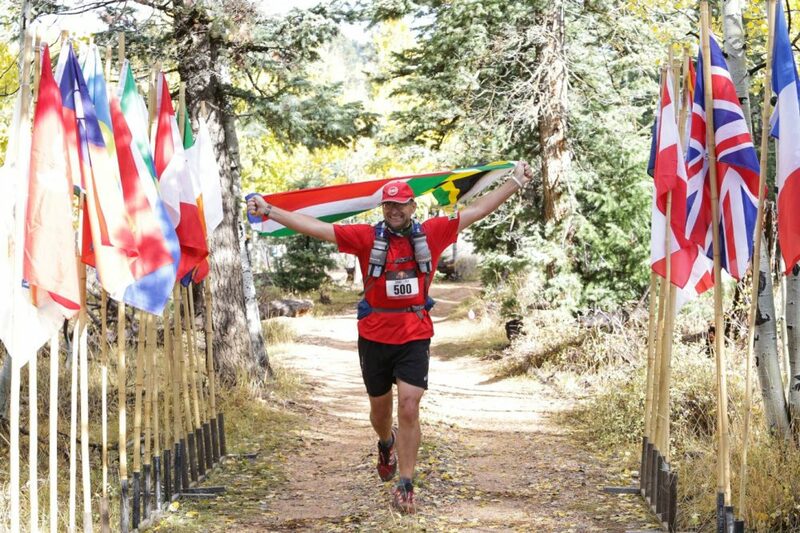 273km Grand to Grand Ultra from 25 September – 1 October 2016 in the vicinity of the Grand Canyon in the United States in support of the END Fund, an organisation at the forefront of the fight against neglected tropical diseases (NTDs) in Africa. 250km Atacama Crossing from 4-10 October 2015 in the Atacama Desert in Chile in support of The Sunflower Fund’s work with leukemia sufferers in South Africa. 250km Last Desert Race from 4-8 November 2014 in Antarctica in support of Greenpeace Africa. 213km Ultra Africa Race from 14-18 November 2013 in Burkina Faso in support of Bono’s ONE Campaign in Africa. 250km Gobi March from 10-16 June 2012 in the Gobi Desert in China in support of SANGONeT. 220km Namib Desert Challenge from 26-30 March 2012 in the Namib Desert in Namibia in support of SANGONeT. 250km Sahara Race from 2-8 October 2011 in the Sahara Desert in Egypt in support of SANGONeT and other South African NGOs. 250km Kalahari Augrabies Extreme Marathon from 17-23 October 2010 in the Kalahari Desert in South Africa in support of SANGONeT. The “Everest Challenge” from 21-22 March 2015 in support of The Sunflower Fund’s ongoing fundraising efforts. This challenge entailed climbing the equivalent height of Mount Everest in 36 hours by ascending and descending the Westcliff Stairs in Johannesburg. David Barnard is a South African development expert with more than 25 years’ executive and senior management experience in international development, philanthropy, governance and ICT4D issues in Africa and beyond. In the recent past, he served as Outreach and Education Ambassador for the Public Interest Registry (PIR), Vice-President: Africa at TechSoup, Executive Director of the Southern African NGO Network (SANGONeT), and Manager of the Programme for Development Research at the Human Sciences Research Council. He is a member of the Africa Policy Advisory Board of the ONE Campaign, and serves on the Board of Imagine SA, and Africa Universities Fund Inc.